The monument is adjacent to where Wisconsin Avenue crosses over the C&O Canal in Georgetown. It is effectively a zero mile marker, although not precisely, as the canal continues a few hundred yards past the marker to empty into Rock Creek. It commemorates the construction of the canal. I caught it right at “magic hour” when the sky is just dark enough that it matches the ambient street light, but is not so dark as to lose all detail and color. Here it has a wonderful indigo glow. And no, no flash was used in the making of this shot- this was purely ambient light from the street lamps and the sky. More specifically, the Georgetown neighborhood. Georgetown may be many things (incredibly overpriced, a tourist trap, insanely busy and difficult to navigate because they refused the Metro when the system was being built) but it is very vibrant and there’s always something going on. It still retains much of the late 18th/early 19th century architecture from when Georgetown was actually a separate city from Washington DC, and has a very distinct feel. I like getting out and photographing there, especially at twilight into the sunset hour, because Georgetown’s position on the crest of a hill overlooking the Potomac really captures the light of that hour like no other part of the city. This is looking east along M Street, one of the main commercial corridors in Georgetown, from the corner of Wisconsin Avenue and M Street. The sun is setting, the light is fading, and the traffic and street lamps are glowing with the first hints of night lights. The cyclist is moving just fast enough to be blurred as he passes through the scene. Here is the famous Farmers and Merchants Bank at the corner of Wisconsin and M Streets. This is an absolutely iconic structure in Georgetown, and is instantly recognizable around the world to people who have visited Washington DC. I love the dull gleam of the gilded dome of the bank catching the last rays of the sun. And here is a glimpse of Georgetown’s industrial waterfront past, where the C&O Canal carves its last yards of waterway through the city before meeting the Potomac River, and where the warehouses for tobacco, wheat, corn, cotton and local products were stored, bought, and sold at the last navigable port on the Potomac. Today, fancy boutiques and high-end condos line the canal, the smokestacks of power plants remaining as decorative follies to remind us of the town’s industrial past. Two views of the National Cathedral at night. I took these the night I went to the Cathedral for a walking tour of the grounds. The first image shows the central tower, scaffolding in place, which is there to further the restoration of the earthquake damage from 2011. Yes, it’s been almost seven years since the earthquake and they’re still not done with the restoration. The reason the restoration is taking so long, budget issues aside, is that the cathedral was built with traditional techniques – there’s no structural steel inside. It’s all stone blocks tied together with iron bow-ties. It could have been a much bigger disaster and the entire tower could have collapsed, but the tonnage of the bronze bells acted as a counterweight and stabilized the structure. No, that’s not dust from the scan in the image – those are the beginnings of star trails from the two and a half minute exposure. I actually like the color balance being impure the way it is here – it adds to the drama of the scene. And since there’s mixed lighting sources (tungsten/incandescent, sodium-vapor, and possibly fluorescent) all in the same scene, it’s a huge credit to the Kodak Portra 400 that I was able to bring it in like this without major manipulation. For those who are wondering, these were shot with my Mama RZ67 and the 110mm f2.8 lens. This was, to me, a bit of a risk-taking. I’ve done each of the components of these images before, in some way shape or form, but never the combination of all at once. I’ve done pinhole. I’ve done panoramic. I’ve done long exposures. I’ve done color. I’ve done multiple exposures. 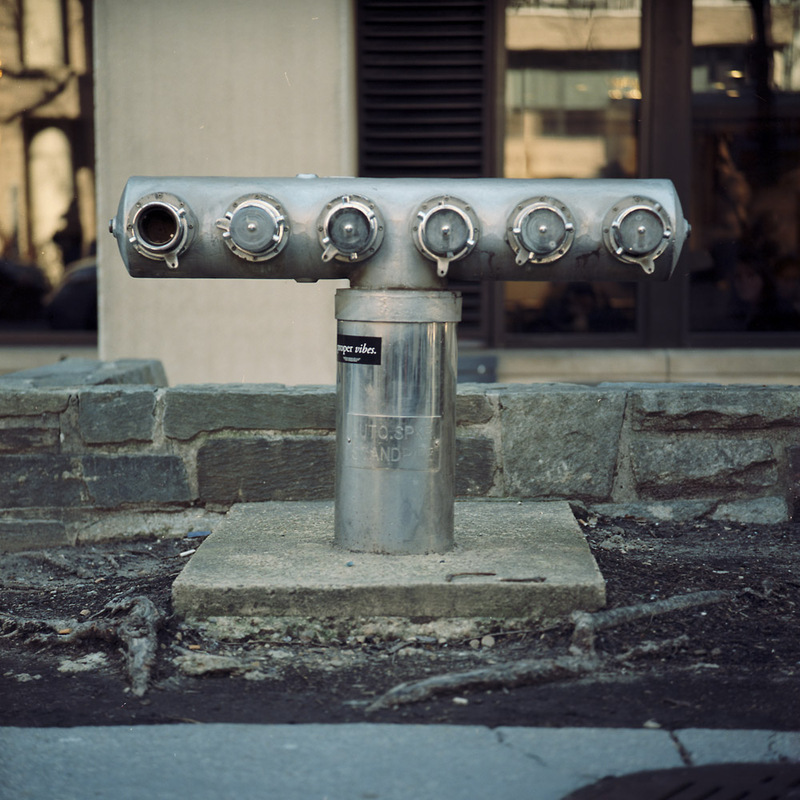 But never color long exposure panoramic pinholes, and even a color panoramic long exposure multiple exposure pinhole. So these are the results of my experiments. The first frame is taken from the intersection of Park Road and 14th Street, looking down 14th Street toward the DC USA shopping complex. This was a 12-minute exposure, using the exposure calculator from my pinhole camera. This was at twilight, thus the (relatively) shorter exposure. This next scene is at the corner of 18th Street and Columbia Road in Adams Morgan. I love the unpredictability of this kind of photography – you know you’ll get patterns of light, and can kind of figure out where they’ll be, but knowing for example that in the span of the 25 minutes of this exposure a city bus would pull through and stop at the light long enough for Woodley Park to dangle mid-scene like a disembodied phantom, well, I couldn’t have predicted or planned that, especially WHERE in the scene it was going to show up. This last scene was a real experiment – Not only did I make a total of a 25 minute exposure, but halfway through I moved the camera about 15 feet closer to the primary subject and re-started the exposure. I don’t know if I’ve ever seen a fire hose connector with more connections on it than this one, outside the George Washington University library. The location may be key – if the library ever catches fire, that much paper will require a lot of water to keep it all from going up in a ball of flame. Either that or it’s some kind of arcane commentary on the Starbucks Coffee in the library basement immediately behind it. I’m a big public transportation junkie, so when I heard they were finally launching the DC Streetcar on H Street Northeast (a public works project over a decade in the making and long overdue – the tracks have been in place for two or three years now), I was so excited I ran over after work last Friday to see it and ride it only to find out I was a day early! So I satisfied my urge and photographed the streetcar at the Union Station end of the line, catching it at sunset. The shiny new car reflected not only the setting sun but the buildings across the street, bringing the surrounding urbanscape out of frame back into the picture. 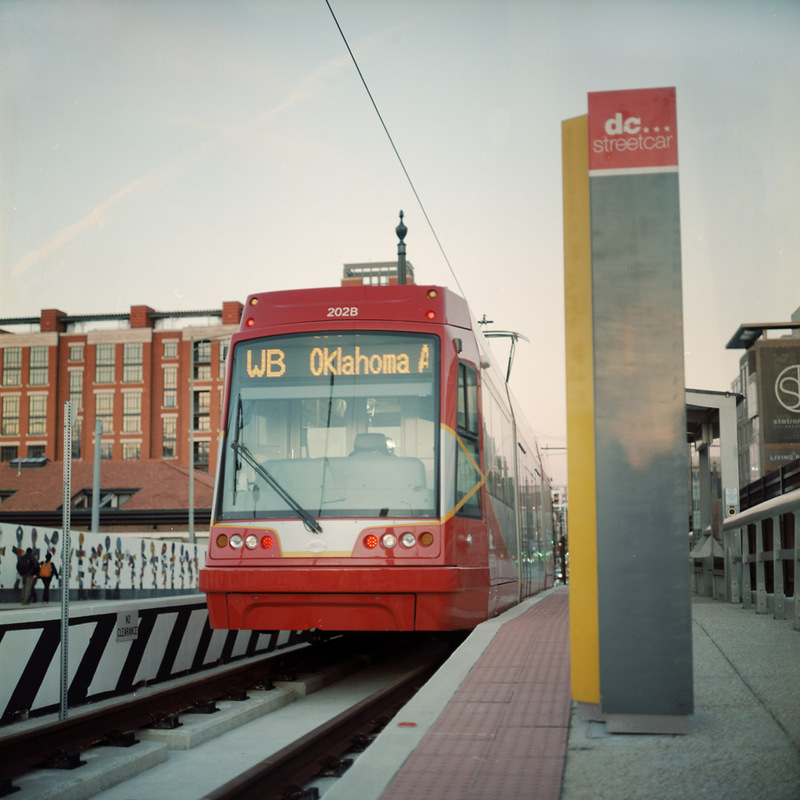 Here is a different view of the streetcar, waiting at the Union Station end of the line, looking down H Street. H Street was, fifty or so years ago, a thriving business district catering mostly to a middle-class African-American clientele. Then along came the riots after the assassination of Martin Luther King Jr., and then with the 1980s, the cocaine and crack epidemics. H Street was devastated. Obviously now, not so much. It has transformed starting in the early 2000s with the real estate boom. Perhaps the turning point was the creation of a large condominium complex, Senate Square, on the grounds of what was originally a Catholic school and later the Capitol Children’s Museum. Now, pawn shops and lake trout joints are being replaced by artisanal coffee roasters, fancy pubs serving British-Indian fusion cuisine, and cultural outlets like the Atlas Theater and the Rock n’ Roll Hotel (which is not a hotel, but a bar and concert venue). Instead of a Murry’s, the neighborhood is now sporting a Whole Foods. 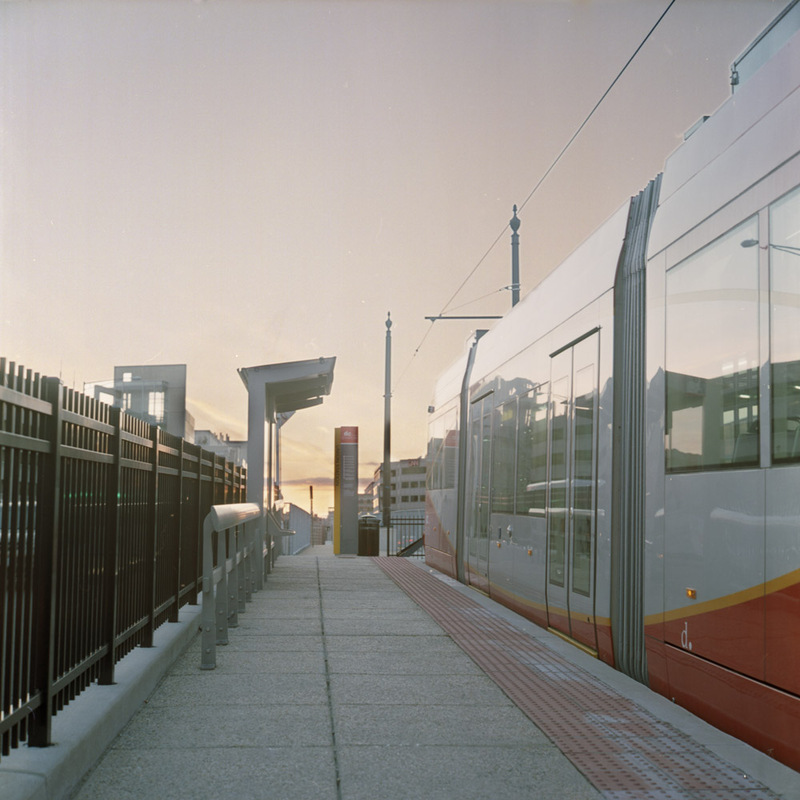 When finally fully operational (at the moment, the streetcar only runs less than half the length of installed track), the streetcar will connect Union Station and the governmental core of the city to east of the Anacostia River, a long-suffering neighborhood where good jobs and access to quality goods and services have been sorely lacking.